Chaz's School Daze: NYC's Bogus Graduation Rate Increases Again. While I usually disagree with the New York Post's Editorial. I find myself in agreement that the NYC graduation rate is bogus. As expected. the NYC graduation rate improved to 75.9% and Mayor Bill de Blasio and Chancellor Richard Carranza proclaimed success in improving student academic achievement. However, the truth is far different. 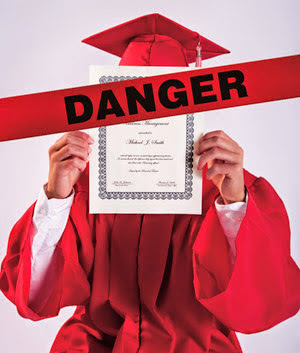 It's no secret that the graduation rate is bogus and that many schools are simply diploma mills. Principals are always pressuring teachers, especially untenured teachers to pass failing students. Furthermore, many schools give "credit recovery" courses that consist of a paper or an online test that the student can take as many times as he or she needs to pass. Finally, the State lowered Regents graduation standards and eliminated the requirement of taking the Social Studies Regents. Finally the academic achievement gap between White/Asian students and Black/Latino students is as wide as ever when it comes to getting an advanced Regents diploma. 50% Asian and 35% White students achieved that goal, compared to only Black 8% and Latino 12% students. You can read the article Here. The global regents was the number one regents exam failed in NYC. So, now students can opt not to take the global regents and substitute another regents exam. Voila grad rates increase! At FHS last year, they set a record for students getting appeals on Regents exams. One student I know got 4 appeals on her Regents exams because she was ISS and her highest scoring one was in the 30s. Now students can appeal multiple Regents exams instead of just one Regents exam and there doesn't seem to be a minimum cut off score. Also, I know at FHS, teachers can no longer give any zeros if students don't hand in assignments or are absent. The lowest score teachers can give on any assignment is 55 regardless of how bad a student performed on the assessment or if he or she did not even take the assessment, and the principal bragged at a faculty conference how more kids are getting credits now than the prior year due to "all their hard work." Really? It's called grade inflation plain and simple. Also did anyone see the 30 point graduation increase at DeWitt Clinton. Did the students just miraculously pass or is it the faculty was under pressure to pass students because they had to interview for their jobs to get rehired? If you can't figure that one out, go back to elementary school. The sad part is that the public who is not informed on these issues keep thinking that the kids in the city are getting brighter and brighter and that what the mayor is doing is working. The minute I read the news story that "NYC school graduation rates have gone up", I laughed. "Sure, they've gone up," I said, "But by which mechanism? Hook or crook?" I decided, based on my experience, mostly by crook. I believe it's called fraud. From the big huppty-do made over the rise in graduation rates, one would think they'd be 10% or more. Then I saw that they were something like 1.5% or 2% and I just shook my head. Even claiming such modest gains took some real gamesmanship in the shell game the DOE plays with graduation rates. If you want to do your own research as to whether a given student should have graduated and is college ready, just ask them a few questions. When you are confronted with a subsequent blank stare, you'll realize they never heard of that stuff in their lives, let alone mastered it or passed any exams about it. All that cutting of classes, playing with their cell phones during class, or partying instead of studying for exams finally caught up with them. Their "graduation" was engineered by fraud. The most successful principals are those who can stay one step ahead of the DOE and state, switching around credits, counting some credits double, intimidating their teachers to pass everyone, changing grades, "losing" students who will pull down their passing rates, etc. It’s the students that are hurt the most. Most drop out of college after a year of taking remedial courses, they supposedly learned in HS, at 0 credits. NYC high schools are warehouses for babysitting teachers. But we teachers are the 'bad guys' and the 'reason' that graduation rates were much poorer in the past. Students, parents, chaotic home lives, ELL status, poverty, poor admin planning and unqualified admins - none of that matters to the education reformers. That is why we all now tow the line and do what the admins say, against our better judgment. These are all nys state policies offering different paths to graduation. Its not the cities fault for using whats available to them. Students only need one history exam to graduate now, they can substitute it for another math, science, or lote exam. State also changed the appeal-able score from 62-64 to 60-64. They also waived the attendance requirement when appealing. Before students had to prove they had 90 percent attendance in the school year of that exam. Now, its much easier to appeal. Reg ed students can appeal up to 2 exams. this is state wide and everyyyy city is taking advantage of it. dont forget about the raw scores that keep lowering on the regents exams. NYS will always decide what numbers they want for graduation statistics and passing exams. Everyone, from Principal to teachers, are guilty of cheating our future generations with knowledge. HS diploma is a joke. Liberals have succeeded. Everyone can learn! listen to all the nycdoe losers! you all make it sound like everyone has to succeed? this country is run by 1% of the population!! the rest of you are just sheep. stupid sheep because you stress and worry about most of those idiots you really cant teach anyway. really sad part is they know it... you don't.